As we all know Galaxy S 6 will be introduced on March 1 at Mobile World Congress, but if you had any doubt about the Galaxy S 6 Edge, you can put that to rest now. 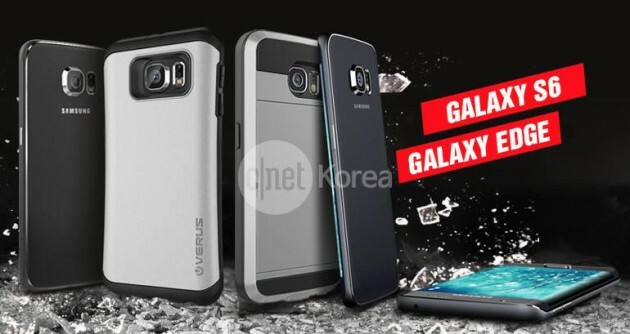 The above image appears to be some sort of ad for a case maker, and for the first time, we actually see both the Galaxy S 6 and the Galaxy S 6 Edge without a case. The phone all the way to left appears to be the standard Galaxy S 6. As you can see, it takes a lot of the same design cues from the Galaxy Note 4. You will also see that the rear camera lens protrudes a little as well. The next two phones appear to be standard Galaxy S 6 devices, but in cases. Let just go ahead and skip them and jump right to the 4th and 5th phones, which are both Galaxy S 6 Edges and naked of any cases. These shots confirm that the Edge will indeed have dual curved edges. You can see a glimpse of the right sided curve on the 4th phone, and the 5th phone confirms the left sided curve. We are less than a month away from seeing both of these phones in the flesh. Are you guys excited?